Damaging winds up 60 mph and an isolated tornado.. The next round of storms move in after midnight. 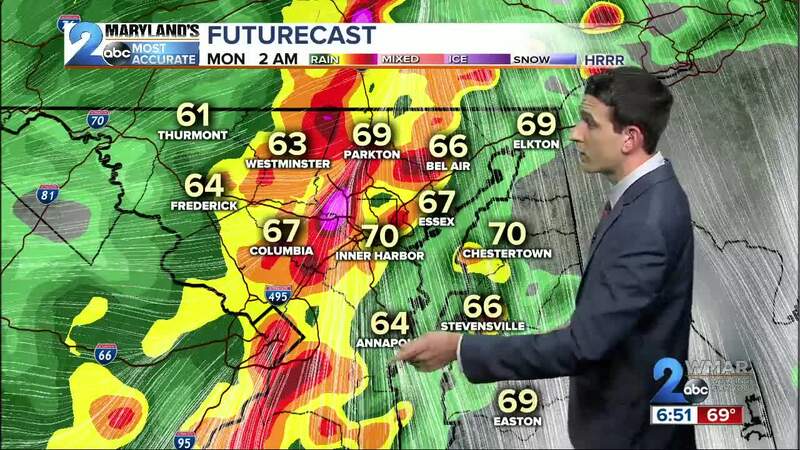 BALTIMORE — A Tornado Watch is in place for Howard, Harford, Anne Arundel, Baltimore, Baltimore City, Carroll, Frederick, Washington, and Allegany counties until 3am Monday. A Tornado Watch means that conditions are favorable for tornadoes to develop while a warning means conditions are imminent. A powerful cold front continues to blast toward the area this evening with several rounds of showers and thunderstorms. The bulk of the energy is north but storms do look to become severe based upon lift form the front as well as warm moist air out ahead of the boundary. For that reason the Storm Prediction Center has put our area underneath an Enhanced Risk for severe weather until the front passes before the Monday morning commute. Primary threats of strong damaging winds, small hail, and localized flash flooding remain for all areas through this evening. An isolated tornado also cannot be ruled out based upon the extra spin above. Timing for the storms still sits between Now-3am Monday as the front moves in from the west. We have a few scattered showers and storms out ahead of the main line which could interject in the severity of the main line as it comes through. The severe threat will wane quickly Monday morning with temperatures falling into the 50s. Wind will be an issue throughout your Monday with gusts around 40 mph. Drier conditions by the middle of the workweek. The time is now to remember your weather action plan. Know your safe spot to go and remember when a warning is issued to take immediate action. Make sure you have a way to get weather information, should any alerts be issued. Our WMAR2News app is free for download from the Apple/GooglePlay store. If you can't get alerts by phone be sure to stay with us throughout the day on Facebook and Twitter for the latest updates as storms approach this evening.